Established in 1896, the National Fire Protection Agency (NFPA) is an international nonprofit organization dedicated to reducing the worldwide burden of fire and other hazards, through advocating codes, standards, research and education. In this article US Chemical Storage demonstrates important chemical storage requirements highlighted by the NFPA. 2. What is the definition of “flammable liquids” and “combustible liquids” in NFPA 30? Class IA – Flash point less than 73°F(23°C); boiling point less than 100°F(38°C). Class IB – Flash point less than 73°F(23°C); boiling point equal to or greater than 100°F(38°C). Class IC – Flash Point equal to or greater than 73°F(23°C), but less than 100°F(38°C). Class II – Flash Point equal to or greater than 100°F(38°C), but less than 140°F(60°C). Class IIIA – Flash Point equal to or greater than 140°F(60°C), but less than 200°F(93°C). Class IIIB – Flash Point equal to or greater than 200°F(93°C). 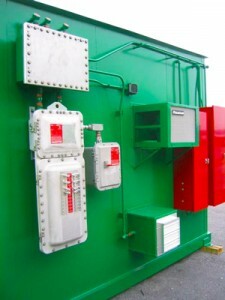 Is venting in flammable liquid storage cabinets required? According to NFPA 30, chapter 4.3.4, storage cabinets are not required to be vented for fire protection purposes. Vent openings should be enclosed with bungs custom to the cabinet’s construction. Vents provide the circulation of air to rid the cabinet of any dangerous vapors. What are fire separation distances? Fire separation distances are regulations regarding the distance in which a chemical storage building is allowed to be stationary to or from existing structures or property lines. 2-hour fire-rated construction allows a chemical storage building to be placed 10-30 feet of an existing structure or property line. 4-hour fire-rated construction permits distances 10 feet from or within existing structures and property lines.